An early Philips colour set - A long and boring history. Re: An early Philips colour set - A long and boring history. That under chassis view looks horrendous, where on earth do you start! Trouble with a set like this is that there is a lot of EHT about at relatively high current that can do a lot of damage to components if things are not quite right. Well done for getting this old 'un back into the land of the living. Thank you for the very kind comments, although most of them belong to the kind folks who helped me sort the bloddy thing out. Interesting things to look out for are the unusual configuration of the anode and cathode of B302P, the strange audio circuit using a pair of high-impedance speakers in series, the direct / flywheel sync switch for the line oscillator / phase discriminator circuit and the flywheel-a-like frame circuit (which I never quite understood). If anyone would like any more info or diagrams then I'll happily post them. Maarten, I'll find out the details when I get back to Solihull and let you know. I think there are a few of these sets kicking around in the UK. One odd thing about this set is that although it has a combined VHF / UHF tuner similar to that used in many continental Philips sets, there is no way of knowing what channel you are on when switched to UHF. The 21KX100A had a display window indicating the channel number but had no motorised control buttons. The place where the window might otherwise have been on the '102A is taken up by a small button to choose between UHF and VHF - The same function button on the '100A was with the On-Off / Speech-Music / Colour Off switches at the bottom of the set. Graham - Re a remote-control option, the set does indeed have a B9A plug on the back for adjusting the controls but I've never seen (or even heard mention of) a remote control for the set. It seems a little bit of a strange thing where you could change the volume, brightness, contrast and colour but there was no facility to switch the set on or off or change the channel. Neil - The underside of the set was incredibly intimidating when first viewed but it all kind-of "sinks in" after a bit and it doesn't seem as bad. The biggest problem with it is trying to access the components - You need to lay on the floor on your front - and then you end up with a cricked neck. I've had to ask my neighbour to help me lift the set onto a very sturdy table for the last couple of fixing sessions. *Actually, I just spotted a few electrolytics and a couple of black pitch caps in the photo of the chassis that I changed along the way. Last edited by Mikey405; 4th Dec 2018 at 4:11 pm. Reason: Addendum. I've loved your write up, not at all boring. Sometimes sets can take ages to restore, particularly if you have to track down rare parts. Your K4 must rank as one of the longest TV restoration projects and kudos to you for persevering because ultimately you succeeded in producing a very reliable performer. What's next on the list I wonder? Thanks for the kind comments Andy. In answer to your question, as I'm down here in Devon for a couple of weeks, the next set (already started) is one you may remember when we lumbered it out of a house in London into the back of a transit van many years back. It's that monster Invicta 16" metal-cone TV radiogram thing with a slightly modified Pye FV2 chassis. (Can't remember the model number off hand but T118 springs to mind.) But that's for another thread I think. Wow! What a write up, not boring at all mate, in fact very interesting indeed and what a great story through all the woes along the way to finish up with a super ending! That is a very nice set you have there sir! 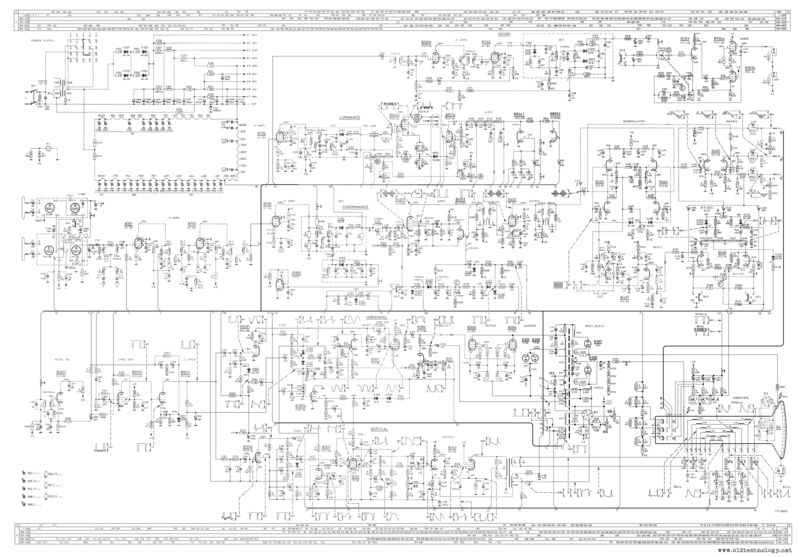 I just took a look at the (similar) schematic - 32 valves!! really? Shame I couldn't come to the bash in October, I would have loved to have seen it operating in the flesh. Long, yes, bordering on epic. Boring, no. Gripping. I'm not that interested in TVs but I read that with interest. A friend's parents had a large Philips colour console set, I think the generation after. Shunt triode EHT reg and all. I remember the huge convergence twiddler panel! Your dedication to the set in spite of all the drawbacks is second to none. I probably would've given up after the second Lopt failed. Well done and what an excellent result. Well done that man. Never thought I'd see that one up and running. Something to look fwd to in the new year at your next open day! Hi Lee, David, Brian, Chris and Mark. Thank you for the kind comments. To be honest, I couldn't really NOT get it going - I just loved the set so I'd never want to part with it even if it never worked again. So then I have the luxury of taking as long as I like. And with brilliant pals like I have, I think it was inevitable it would work in the end. Lee - Don't worry about copying my avatar - Frame sync problems are very common - I'm sure you'll get your logo working again very soon. Probably just a coupling cap. I'm just too lazy to fix mine. Last edited by Mikey405; 11th Dec 2018 at 8:42 pm. What a superb result after a real saga that would probably have caused me to give up. Very well done! Wow! What a Beauty! Hope to see this one day! I had no idea such an early colour set existed in the UK! Hats off to you for your determination and for saving it. What an amazing and interesting story, never knew such a set existed either. First glance it looks like a mono set but definetly isn't and what a great looking picture it has too! Just awesome! Thanks everyone for the kind replies. Apologies for only just spotting then - Life gets no less busy and I've been rather neglecting my duties. Gripping story and a reminder of a time when there were many outside the BBC who wanted to get going with colour TV even on 405 lines. Does the G6 seem a bit of a step backwards in design from this to you? Congratulations on a seemingly impossible task now completed and working beautifully. Persistence is all. Most of us would have given up much earlier in the saga. This was practically half a lifetime in the realising, but what a beautiful looking set. I can see why you felt you had to sort it out, despite the overwhelming problems. All times are GMT +1. The time now is 5:57 am.